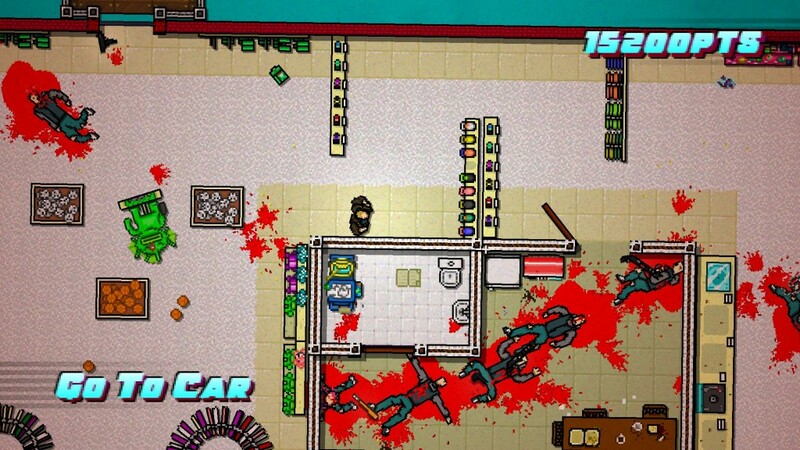 The first Hotline Miami was a fairly momentous release. Clearly the product of a madman with a nasal spray addiction, it was a constant stream of action, violence and brain thumping music. There was nothing quite like it before, and nothing since has scratched the same itch that a full floor melee combo did so well. As such, the sequel, Wrong Number, has been one of my most anticipated releases for some time. However, while I consider it an overall success, Wrong Number misses out on many points that made the original great, with more tedium, an awkwardly slower pace and a less successful, though more intricate, story. 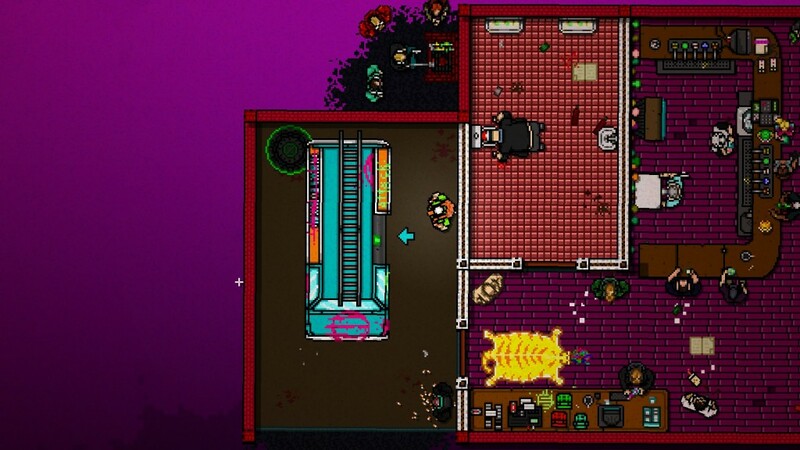 For the uninitiated, Hotline Miami is a top down action game, somewhat akin to a twin stick shooter, in which you must kill all enemies on the map in varyingly brutal ways. Most everyone, yourself included, is one hit kill, meaning every strike must be precise and deaths will be plentiful. A combo system encourages the player to string kills together in quick succession, and a diverse kill/execution system drives them to experiment with the various weapons, which range from baseball bats to guns to a pot of boiling water. It’s simple, gory, dark and at times hilarious fun. Bigger seems to be the theme of Wrong Number. There are more levels, with more sections, all filled with more enemies than the first ever had. Initially, this had me excited at the prospect of extremely long combo chains in an increasingly ostentatious murder ballet. The best moments of the original involved running into a room, beating someone down, throwing your weapon at another only to pick up another weapon to fight off incoming enemies and execute the downed ones. While there were guns, they tended to be far less interesting and strategically situational. However, bigger levels introduce two major problems which severely hampered my enjoyment of the game. First of all, though the level size has increased, view distance hasn’t, and while you can pan the screen somewhat, you will inevitably be shot and by distant, unseen enemies repeatedly. This is incredibly frustrating the first few times, but eventually becomes part of the routine of learning any given level. This is not a good thing. It’s restrictive and inhibits the core flow that made the first so addictive. Second, and largely related to the first, is the increased emphasis on gunplay, both from the player and from enemies. Levels are not only larger, but tend to be more open, and because the AI has very nearly absolute accuracy and 360 degree vision, running up and clubbing them down is impossible on many stages. The number of enemies that absolutely must be killed with guns is also up, being relatively rare in the original. So instead of running around going ham on people’s faces and sphincters, I was often forced to play peekaboo around corners with a shotgun, either to kill a far too distant Russian gangster or to draw them in closer. Bigger should mean more open, more readily manipulable by the player’s creativity, but it does nothing but limit your strategic choices. Character choice is similarly more varied, yet also more restricted. Over the course of the non-linear story you will play as part of about five different groups. Sometimes you are not given a choice, but when you do the different characters have unique abilities that affect how you play. But even then you usually only have three or four choices. Compared to the first game, where every mask and ability was available in every mission, this ends up being frustrating and far less interesting, particularly when you want to play through a level with a certain character. Story-wise, I have rather mixed feelings. It is a direct(ish) sequel to the original, with part of it taking place after the events of the original and others before. Jacket is on trial for murder, the Russians are without a leader, a group of ‘fans’ don masks and kill in his honor, a cop looks for a serial murderer….. that’s about half of the storylines you’ll follow. At first it’s interesting to see the story jump back and forth through time and place, trying to connect the dots and see the final point. But eventually, as character arcs end before they are ever developed, ties to the original get thinner and thinner, and the normal ending comes around, it becomes tiring and unfulfilling. Jacket’s story was interesting because, without a lot of dialogue or cutscenes, we got to see a seemingly regular man grow progressively more violent, sicker, more dangerous, then see him try to redeem himself, only to lose what he cared about most. It was a delicate tale, made all the more profound by the rather indelicate way you murdered hundreds of people with impunity. 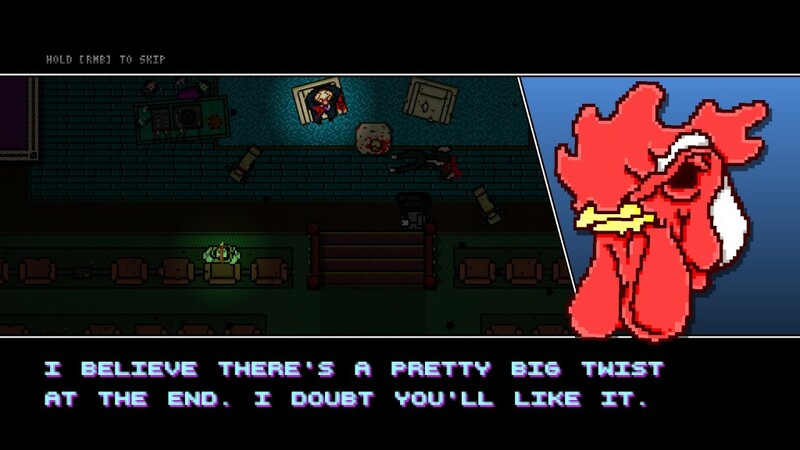 With perhaps one or two exceptions, you never get to really watch anyone change in Hotline Miami 2. It’s just a collection of people, half of whom are inexplicably skilled at killing, eventually having unfulfilling deaths before anything really interesting happens to them. I would have much preferred to play as half the characters in order to become more involved. It sounds like I hated the game, but that couldn’t be further from the truth. It’s still an enjoyable murder simulator… er, game. It’s still satisfying, perhaps more so due to the aforementioned limitations, to go on twenty kill combos, constantly switching weapons and flying through the level. And despite my problems with the overall level design, I must admit the level of visual detail has gone up immensely. 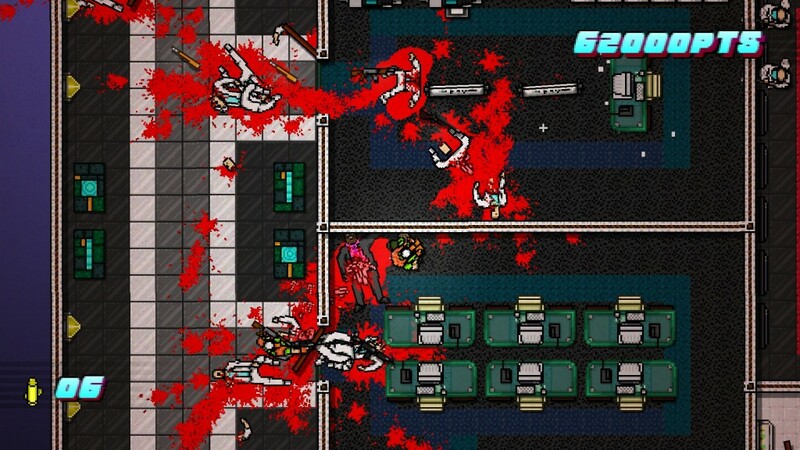 The stages of Hotline Miami were fairly sparse, with set pieces and interactive components being far and few between. In Wrong Number, more effort has clearly gone into filling out the rooms with ‘stuff.’ Though somewhat superfluous, it nonetheless gives the stages a more ‘tactile’ feeling when you are destroying props and objects in rooms as you go on a rampage. The sense of collateral goes a long way in immersing you. It makes the problems I have with the overall level design feel all the sharper, since I enjoyed exploring the levels themselves far more than I expected. 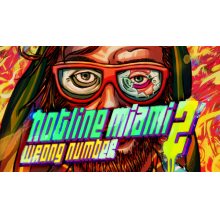 Hotline Miami 2: Wrong Number is still a good game that might be best summed up by a comparison of its soundtrack to the original. Longer, more varied from track to track, and perhaps overall better, but missing the heart-pumping power of the original. DO YOU LIKE HURTING OTHER PEOPLE CREATING LEVELS?